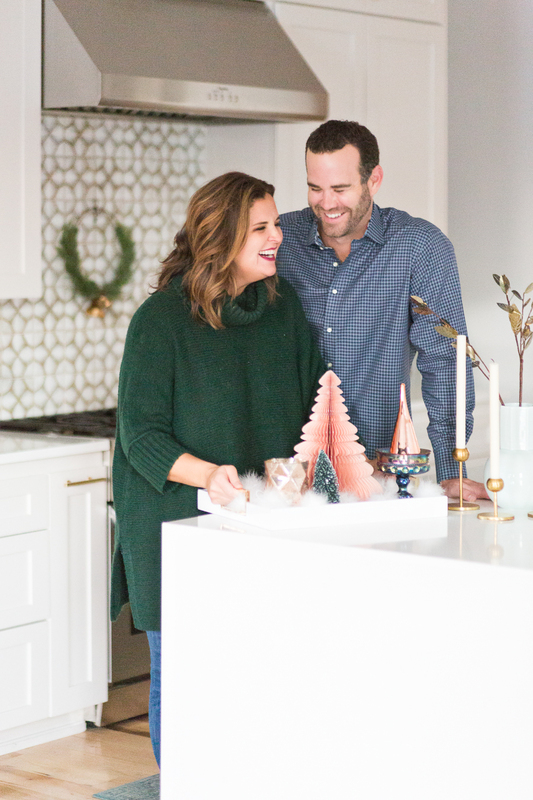 CC and Mike are all about reducing that holiday stress which is why I’m writing this blog post on 21 Easy Christmas Decor and Gift Ideas from West Elm—to help make holiday Christmas decor and gift shopping easier on everyone! Let’s just put it this way—how many stores can you shop both for your home and get everything you need for your Christmas Decor, as well as pick up gifts for everyone on your gift list at the same time?!? 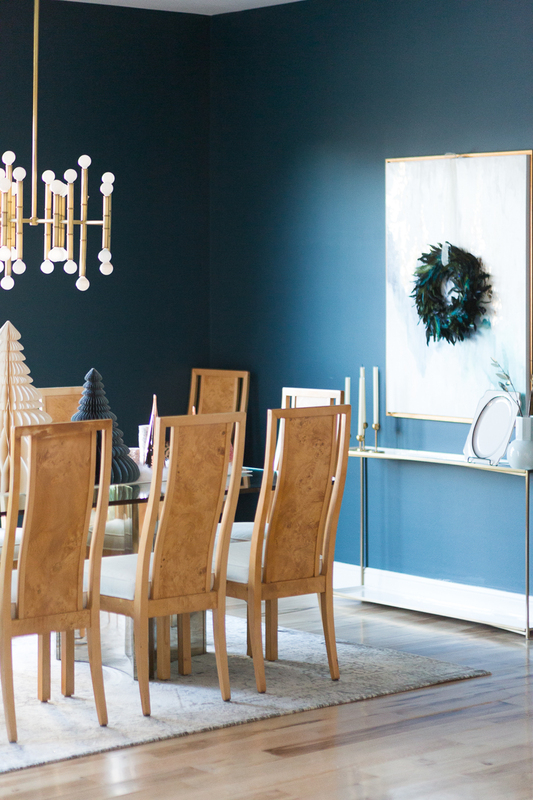 West Elm is the Ultimate Christmas decor and Christmas gift destination this Holiday season and I’m going to show you why in this post! 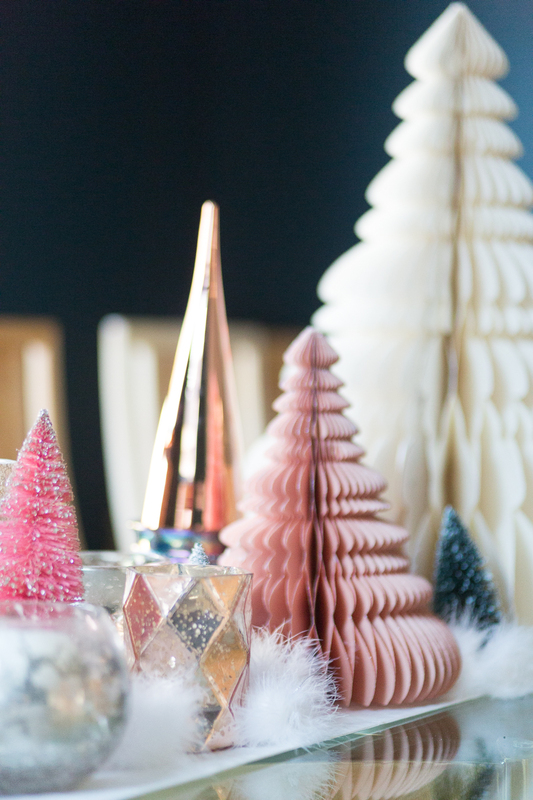 I am so blown away by the Holiday Decor that West Elm has this year and there are many items that I recommend you run out and buy before they are all gone! Why? 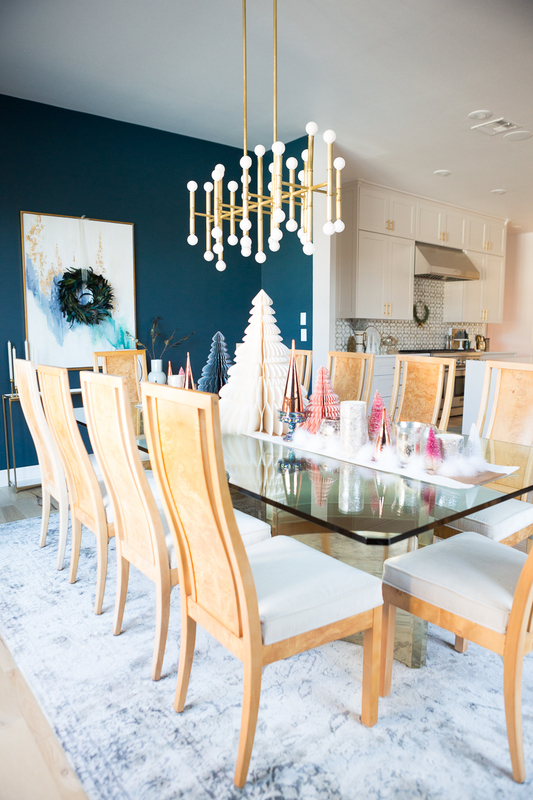 Because let’s be honest you guys, the Holidays are no freaking joke and we all need fast and easy Christmas decor ideas that won’t break the bank. 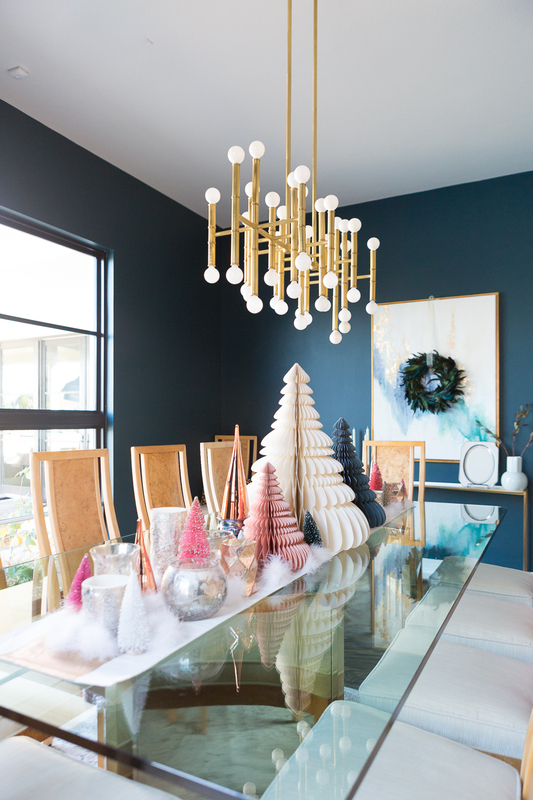 Trust me, West Elm has us all covered this Holiday season with their accordion Christmas trees and copper trees, tabletop trees, fur garland, gold candlesticks, gorgeous trays and much, much more. In addition to that, West Elm is full of amazing items that are perfect for hostess gifts, home decor lovers, coworkers, friends, and family. 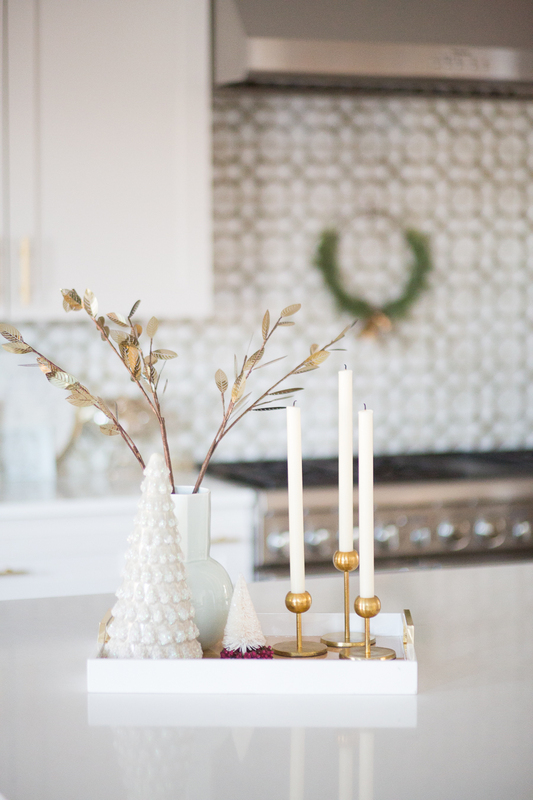 FIRST UP LET’S TALK ABOUT EASY CHRISTMAS DECOR IDEAS FROM WEST ELM. 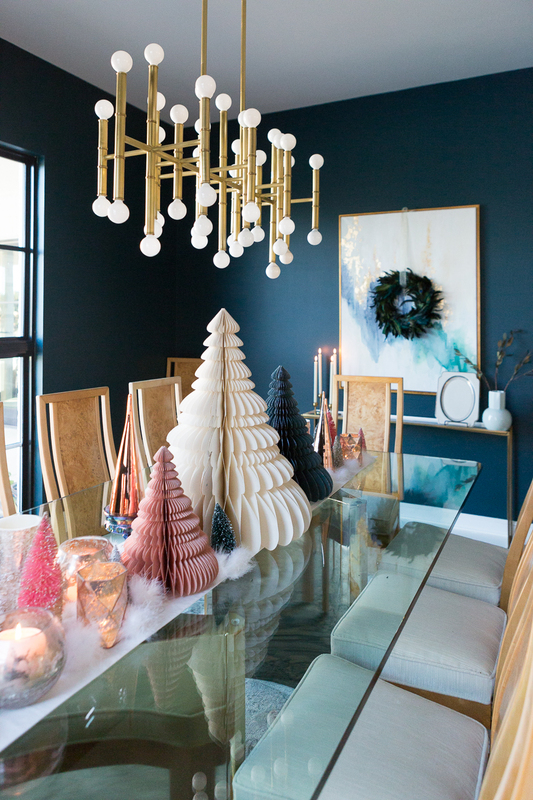 As I planned my tablescape for this year, I was drawn to West Elm’s accordion trees and accordion ornaments. I love the simplicity of the paper trees available in three different colors. As you will see, I styled them not only on my table but also under my tree. These are going to sell out quickly and I can’t tell you how highly I recommend you pick them up before they are gone. I got one in every color and size but I am particularly smitten with my large white tree. 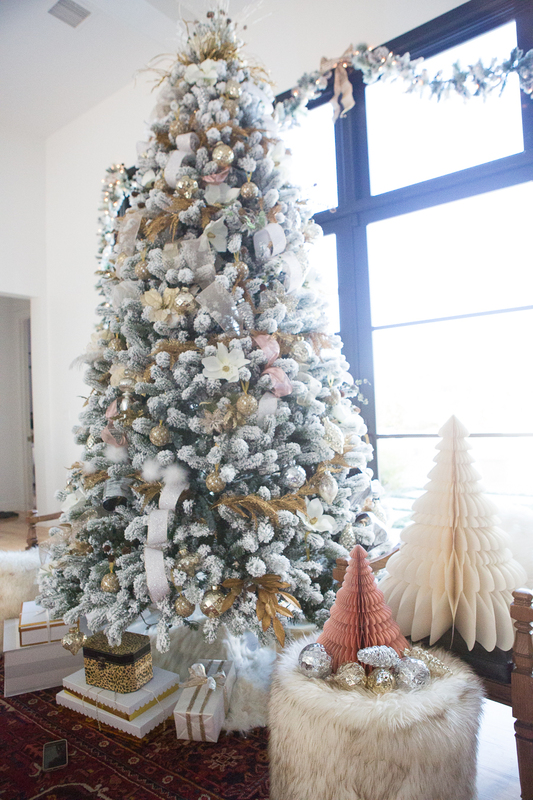 The white accordian tree in the medium or large size is so great to use for your holiday table, coffee table styling, kitchen tabletop styling, and even under the tree! I can tell that these accordian trees are going to be something that I keep and use as a staple for my Christmas decor over the years. 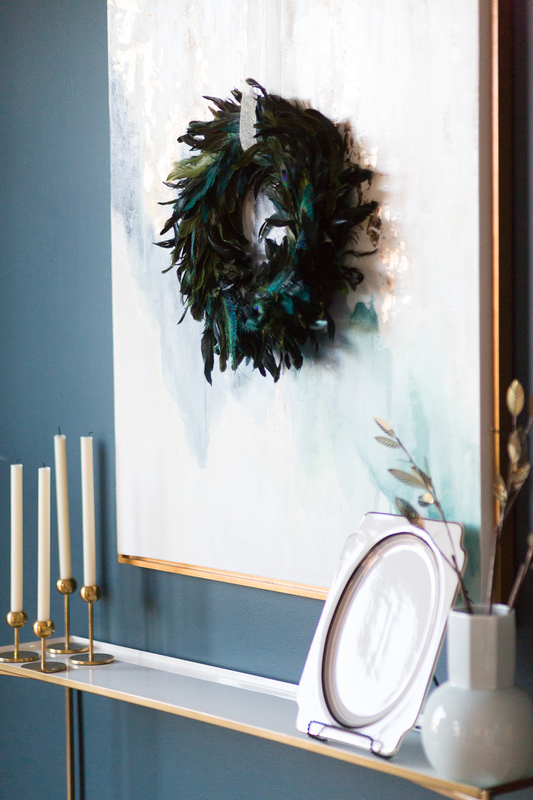 The fur garland from West Elm is also a must-have. I mean who doesn’t love fur! Fur garland?!? Even better. 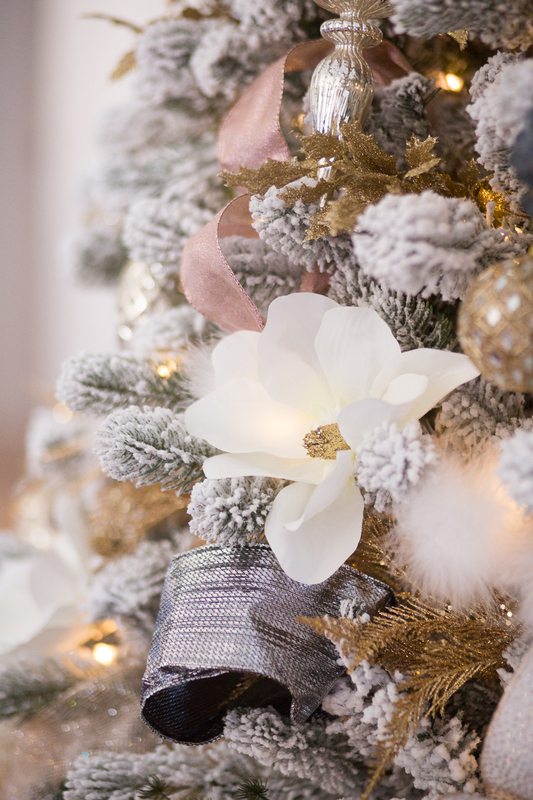 As you will see, I styled it two different ways to show how easy it is to use this fur garland from West Elm to accessorize your holiday tables and trees. 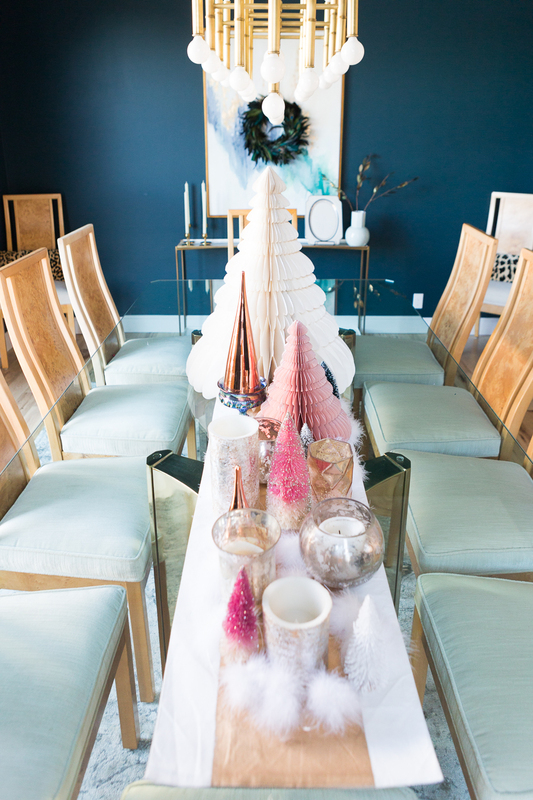 First of all, I used it on my holiday tablescape and draped it amongst the accordion trees, bottlebrush trees, and mercury vases and the effect is gorgeous! It gives the look that the trees and mercury vases are floating on snow and I LOVE IT! I picked up 8 packages of the fur garland and you guys, I wish I would have bought more. I also used it on my tree to add some glam and I think I’m going to have to go back and grab more before they run out! I recommend you do the same because it will probably go quickly. Finally, West Elm‘s mercury vases that I just mentioned are a must-have for easy Christmas decor and to give you ideas of how to use them, they can be used on your holiday dining table, on your coffee table; and if you buy the large size you can put a table top tree inside them which is such an easy Christmas decor idea. 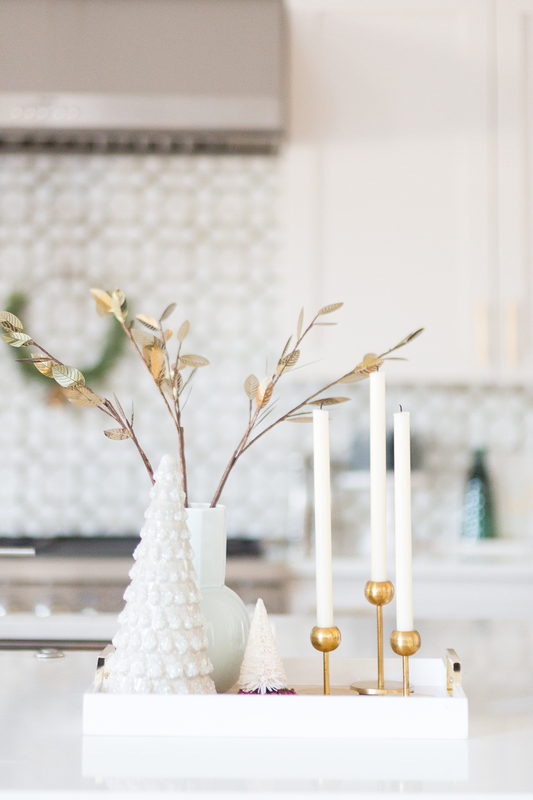 Basically you can use these mercury vases anywhere around your house and they are a simple and easy way to Chrstmasify (yes that is a word I promise) your entire house! NOW LET’S TALK ABOUT EASY & AFFORDABLE CHRISTMAS GIFT IDEAS FROM WEST ELM – West Elm is taking the guesswork not only out of your Christmas decorating, but it is also making your holiday gift shopping a breeze. 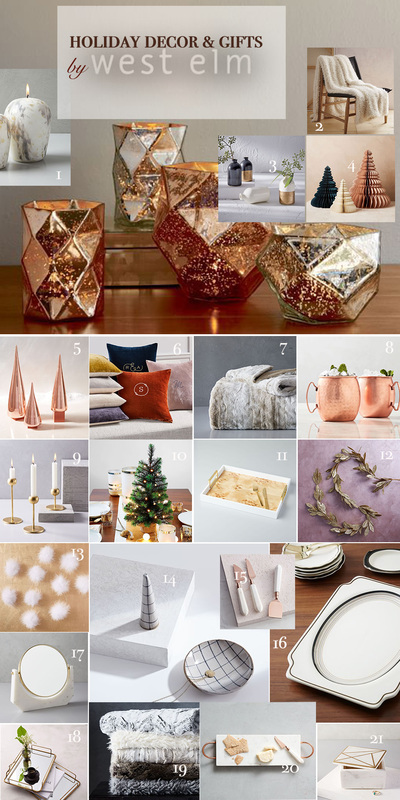 Many of the items I mentioned also make amazing gifts, especially the mercury vases and tabletop trees, so you can shop for your home and grab some gifts at the same time. Sounds like an absolute win-win situation to me! 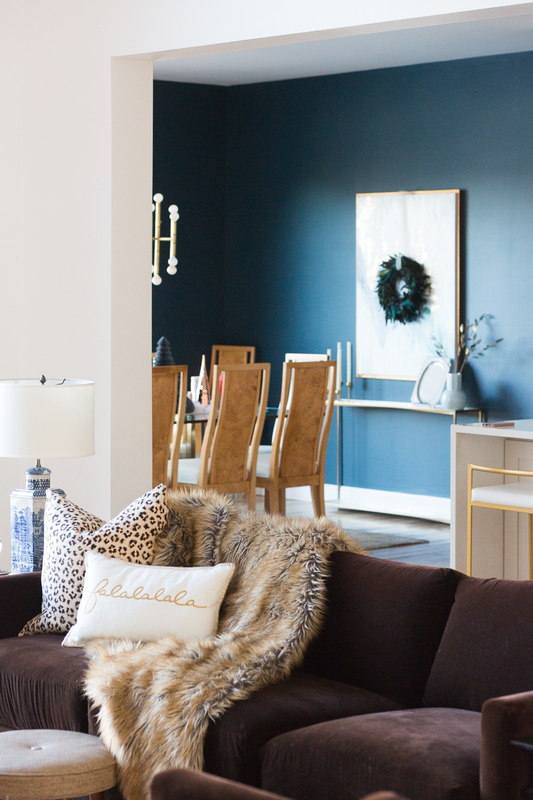 Other favorites for gifting from West Elm are their fur throws in 5 different gorgeous colors, sherpa throw which is monogrammable – yes please!, bud vases (under $20! ), ring and jewelry trays, vanity mirror, and marble candle (also under $20), and an absolute favorite is this Deco Gold and Marble Bar Ware Set. So as you can see, CC and Mike are a fan of keeping your Holiday stress free. 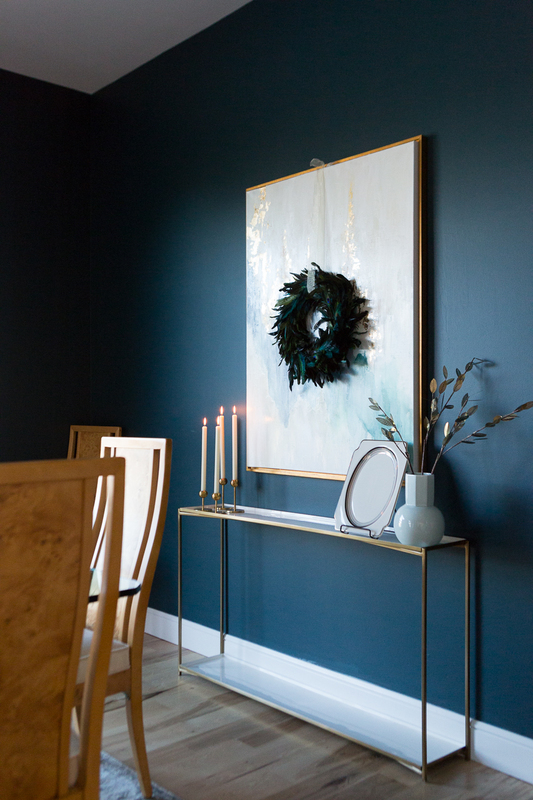 So do yourself a favor and shop right from your computer for your your Christmas decor and holiday gifts, or, run out to your local West Elm and get your Christmas Decor and Holiday Gift Shopping done all at once. 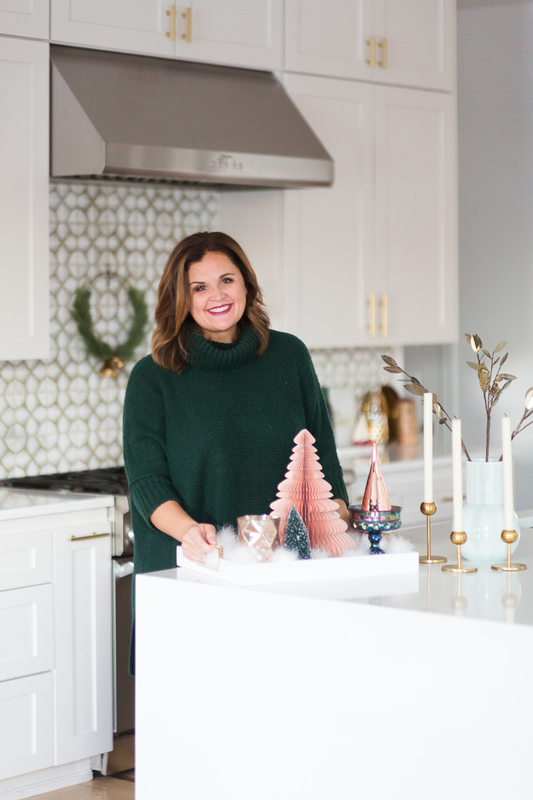 Without further ado, here are 21 Easy Christmas Decor and Gift Ideas from West Elm as well as all of my favorite holiday products that West Elm has to make your Christmas decorating simple and stress-free this year! Thank you for stopping by CC and Mike’s! We are so thankful you are here. If you don’t want to miss a post, make sure to subscribe to receive updates. 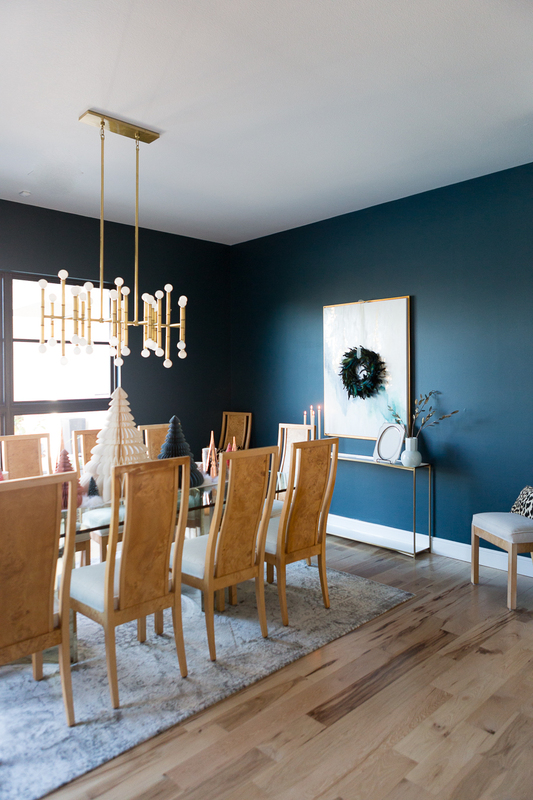 We hope this post makes decorating your home and giving gifts this Holiday season a little bit easier so that you can enjoy what this season is really meant to about – time with those you loved most. Happy Holidays everyone from CC and Mike and crew! 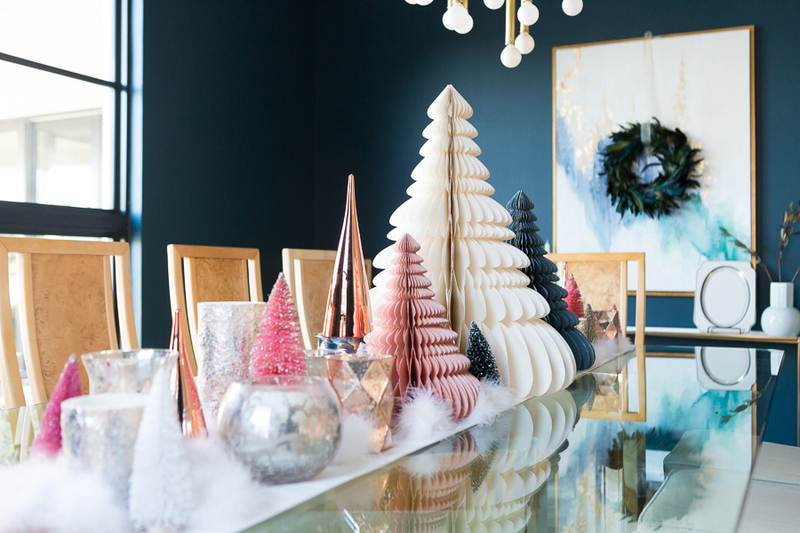 Love all the new holiday decor from West Elm!! Fur garland? Yes please!! I love how you used it as part of your centerpiece. Your photos and holiday decor are gorgeous and so festive CC!! Your house looks amazing! I love the West Elm accordion trees! I’ll have to check them out! Thank you Alma! 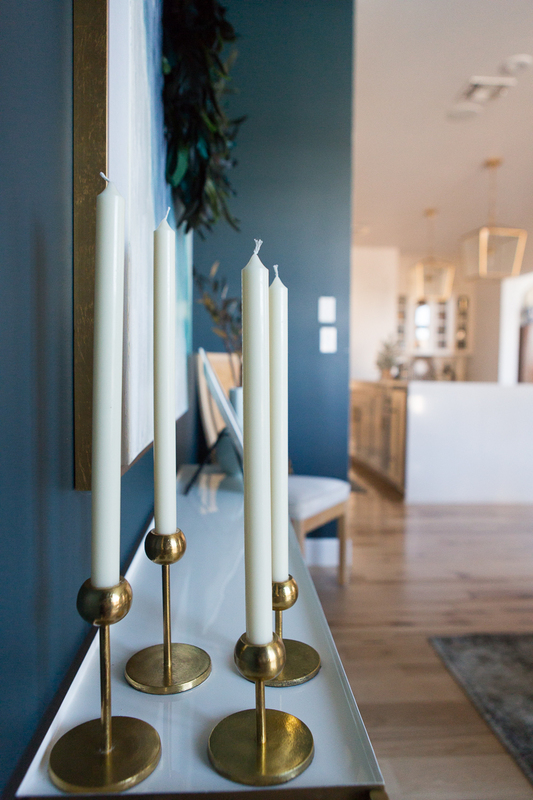 Those candlesticks are a must have! You will love them! They will go perfectly in your gorgeous home! CC this is so gorgeous!! I can’t pick my favorite part, it’s all so good!! 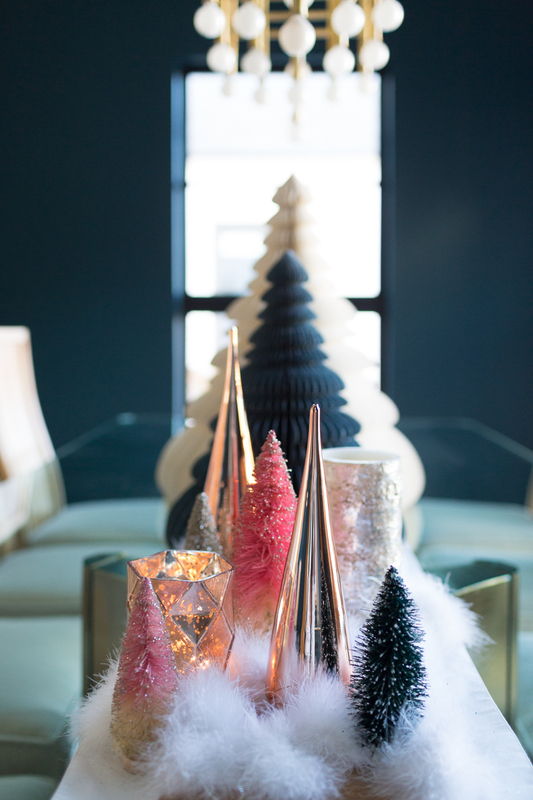 CC it is all gorgeous, your holiday decor is perfect and not over the top. Love it! And that tree—stunning! Thank you Amy! I really appreciate the kind words!